Articles and videos related to Transport. Since the Evening Standard and The Independent newspapers have written about this I thought I would add some more detail to those proposed services from the map. 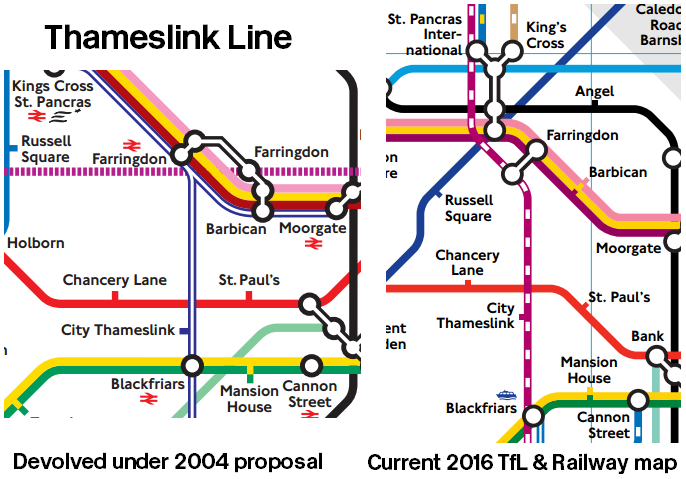 I've only just found out about the 2016 Tube map from a 2004 proposal and a lot has changed when compared to the present one we have. You can view the full resolution (PDF format) of the 2016 proposed map from 2004 here. Back in 2008, BBC News reported on the big cuts to various projects like the DLR extension to Dagenham Dock, the Thames Gateway Bridge and Tramlink extensions; the BBC claimed that TFL is trying to save £2.4 billion! In January 2007, TFL issued a press release about consulting people on the proposed DLR extension from Gallions Reach to Dagenham Dock. Back then, TFL sent out 60,000 leaflets to local residents, organisations and groups to gather opinions on the extension. 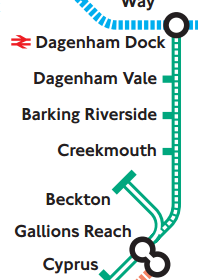 However, from the 3rd February 2016 board meeting, a released paper shows the Barking Riverside Rail Extension from the ‘Goblin’ Overground line. TFL had a page on their website for the Dagenham Dock DLR proposal which is now saved by the Archive Wayback Machine. Looking back at the map, the Thameslink line is mentioned as it would have been devolved to TFL. The Thameslink section from Farringdon to Moorgate was withdrawn in March 2009. 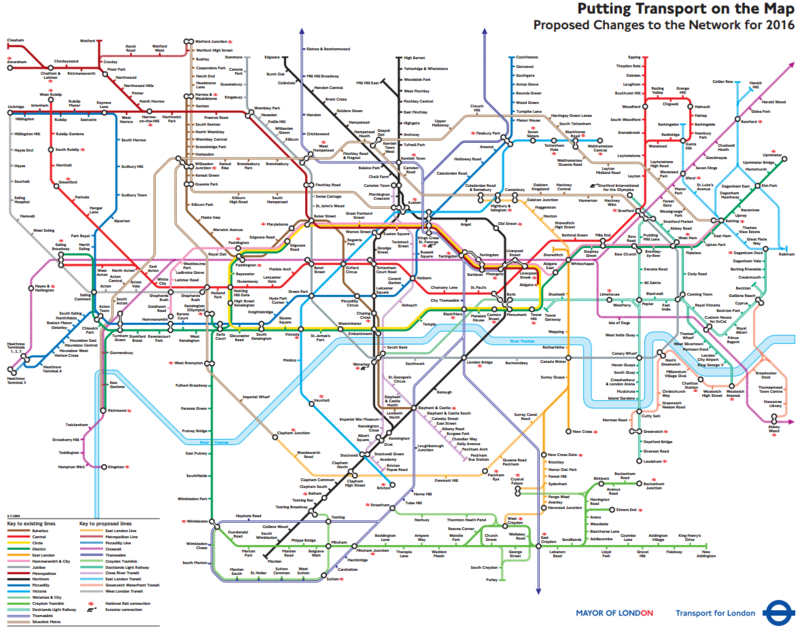 The good news is the Department for Transport have announced proposals to transfer lines operated by Southeastern, South West Trains and Govia Thameslink Railway (Great Northern, Thameslink and Southern) to TFL in order to create a London Suburban Metro. Looking at the ‘Crossrail’ line, the Maryland station would have been disused and not included until 7th August 2006 when the ability of ‘Selective door operation’ would enable the station to be accessible due to the short platforms. Currently the Shenfield Line is under TFL Rail with the operation contracted to MTR Crossrail. The Crossrail tunnels will open in 2018 with the line fully completed by 2019. The Silverlink metro lines have been devolved to the London Overground who took them over on 11th November 2007. The franchise was the ‘North London Railway’. What happened to Surrey Canal Road station on the Overground? As phase 2 of the East London Line extension along the South London Line to Clapham Junction opened on 9th December 2012, it would have seen Surrey Canal Road station opened, but instead, due to the lack of funds, it made the station unable to open. The plans are still proposed though, hence the reason they built concrete padding to 'future proof' the proposed station. Since February 2015, the proposed station has been changed to New Bermondsey as part of the new development of the area. Here is more information on the New Bermondsey station on Wikipedia. After looking at Tramlink and Tfl's proposed extension from Harrington Road to Crystal Palace, I noticed that in the June 2007 TFL Press release, which had shown strong support for the Tramlink extension that the consultation had received a total of 1,520 responses. In the same press release there was also a webpage from TFL dedicated to the Tramlink extension. What about those transit routes? Taking a look at the East London Transit, they are a branded Bus Rapid Transit service which serves from Ilford to Barking Reach and Dagenham Dock. The service was first formed in 2010 and is operated by Go Ahead Blue Triangle from their Rainham (BE) depot. Route EL1 was extended from Thames View Estate to Barking Reach and began on 7th September 2013; it required an increase of 1 bus which Go Ahead London transferred from one of their depots. During November 2015, TFL proposed to re-route the EL2 which would go to Becontree Heath, serving Longbridge Road and relieving various bus services serving that section of the route. The proposal for route EL2 will no longer serve Ilford. Now with the West London Transit, it looks similar to the current service we have which is route 607 serving Uxbridge, Hayes End, Southall, Hanwell, Ealing, Acton, Shepherd's Bush and White City. The service is a ‘Limited Stop’ as it goes parallel to the main route 207 which only serves from Southall to White City. Taking a look at the proposal from the Wikipedia article, it would have been a Tram service in West London as it would have replaced an equivalent number of bus routes. The proposal was postponed by TFL in August 2007. The scheme was budgeted at a cost of approximately £200 million, and the line would have come into service by 2009. Here is the link to the proposal from TFL's old website. The Greenwich Waterford Transit was a proposed Bus Rapid Transit and part of the Thames Gateway Transit linking to the north side of East London, via the proposed Gallions Reach Crossing bridge to Greenwich. The crossing is still proposed as we are waiting to see more proposals on the crossings in the East of Greater London. Currently there is a consultation for new river crossings in East London. Here is the Wikipedia article on Thames Gateway Transit. With the Cross River Transit, known as the Cross River Tram, it was a proposed tram service which serves from Camden Town in the north, through Euston and London King's Cross, to Peckham and Brixton in the south. As of 2010, TFL stated that the project is on hold. Article is also on Wikipedia. So what else now? Instead we have improvements made to the London Underground system and the cuts have enabled the funding of the New Routemaster bus which was supposed to reinstate the rear platform. However, instead of the rear platform it's a hybrid bus with 3 doors and 2 staircases which is designed by Thomas Heatherwick. Also, since TFL's board approved the extra 200 New Routemasters (from 800) we may see 1,000 of the NRM’s operating on London roads. Thankfully the design of the New Routemaster bus has evolved to other types like the Alexander Dennis Enviro400H City. I can't think of anything else to add to the above except to say that it's interesting how plans and proposals change over a period of time. If you have any more information then let me know in the comment section below. ULTra Heathrow PRT - We need them everywhere! The Son Of (New) Routemaster with 2 doors 1 staircase! My views and opinions are entirely my own and may differ from those held by TfL and other transport authorities, their operating companies in the UK and the wider world. Some of my articles may feature excerpts of articles and press releases from various websites (such as magazine sites, transport authorities, transport companies, manufacturers etc.) which is shown for research and review purposes under the UK’s Fair Dealing. ©CLondoner92. Simple theme. Theme images by urbancow. Powered by Blogger.